Autumn Ness, Matthew Rubbelke, Traci Allen Shannon, Reed Sigmund, and Bradley Greenwald try their hands at flying kites in A Year with Frog and Toad. Photo by Dan Norman. A most splendid year with Mr. Frog and Toad is offered to all who attend A Year with Frog and Toad at Children’s Theatre Company. The musical is based upon Arnold Lobel’s children’s stories about the simple adventures of Frog and Toad. Robert Reale wrote the music for the show and his brother Willie Reale wrote the book and lyrics. The show had its world premiere in 2002 at the Children’s Theatre Company in Minneapolis and then opened on Broadway in 2003, garnering three Tony Award nominations. Director Peter Rothstein and Musical Director Victor Zupanc provide a delightful revival. 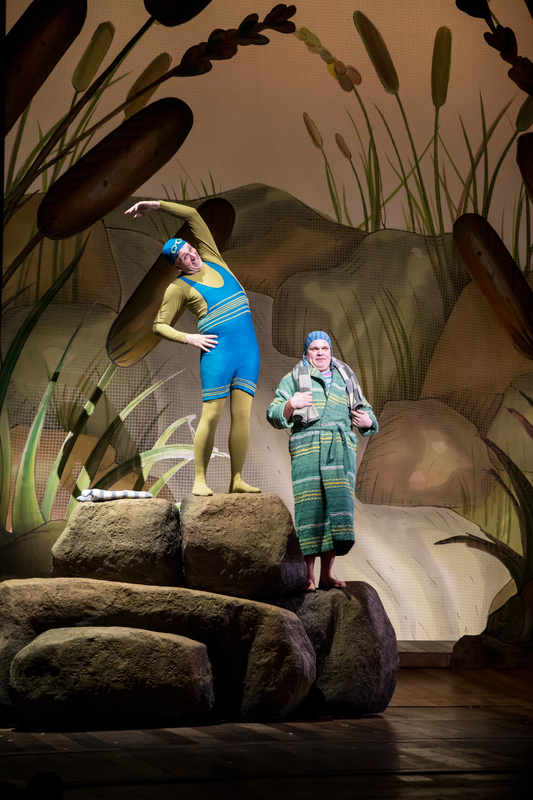 Frog (Bradley Greenwald) and Toad (Reed Sigmund) among the bulrushes. Photo by Dan Norman. Frog (Bradley Greenwald) and Toad (Reed Sigmund) are amphibians who are the best of friends. Each scene is a vignette retelling a different story from Lobel’s series of books. One story concerns Frog sending a letter to his friend Toad, who is sad because he has never received any mail; the only problem is that Frog asks a snail to deliver it, so it takes nearly the whole play to arrive. There are also stories about topics such as kite flying, raking leaves, and sledding. The story starts in the spring when the birds return and both Frog and Toad are waking up from hibernation in their separate homes. Through the different stories, we see that the two spent a lovely summer, fall, and Christmas together before entering another cycle of hibernation. Joining them in their exploits are a menagerie of friends including Bird, Snail, Mouse, Squirrel, Lizard, Mole, and Turtle all played by the chorus of Traci Allen Shannon, Matt Rubbelke, and Autumn Ness. The cheery musical numbers relate to the stories with such titles as “Spring,” “The Letter,” “The Kite,” “Down the Hill,” and Snail’s solo “I’m Coming Out of My Shell.” Parents should be prepared for the frantic “Cookies” song, since it occurs right before intermission, resulting in hungry children making a beeline to the concession stand for…well, you can probably guess. The play’s primary theme is about friendship, which is remarkably captured by Greenwald and Sigmund’s creation of these gentle creatures who enjoy each other’s company. Parents should have no concerns about content; Frog and Toad are very kind to each other and very clearly cherish their time together. Shannon, Rubbelke, and Ness all shine in their various moments as the rotating cast of supporting characters. The group dazzles in its execution of Daniel Pelzig’s whimsical choreography. Matthew Rubbelke, Traci Allen Shannon, and Autumn Ness strike a pose in A Year with Frog and Toad. Martin Pakledinaz’s costume design works on the principle of signifiers; the result works well to suggest the form of the different animals, without obscuring the actors’ human forms. The scenic design by Adrianne Lobel, daughter of the late Arnold Lobel, marvelously evokes the lead character’s different residences, a pond and a hill. The sound design by Rob Millburn and Michael Bodeen is also excellent. Children and parents alike will be enamored with the musical’s endearing characters and stories. An added benefit for parents is the positive influence it has on children. After bringing my grandchildren to the show, they proceeded to spend the next week playing Mr. Frog and Mr. Toad, with each trying to be the kindest to the other. 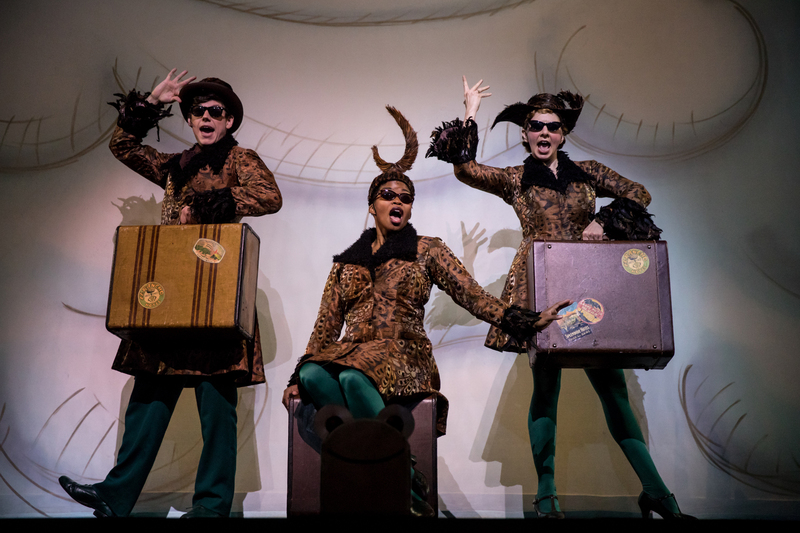 A Year with Frog and Toad plays through June 18 at the Children’s Theatre Company in Minneapolis, MN.